This post is part of a series documenting the new swamp being created on capitol hill by Stephen Bannon. It details the relationships between Stephen Bannon and billionaire, Robert Mercer, his daughter Rebekah Mercer and other assorted characters on the Far Right. 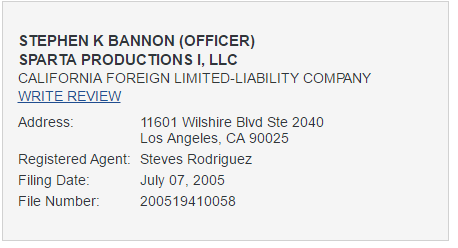 Stephen Bannon and certified public accountant, Steves Rodriguez, have a relationship that goes back many years. 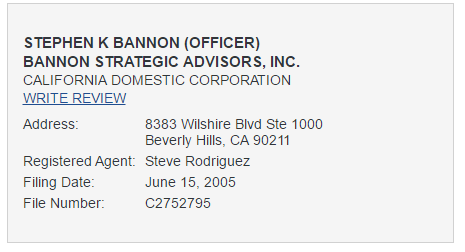 Rodriguez isn't just Bannon's accountant, he's also been in business ventures with Bannon. 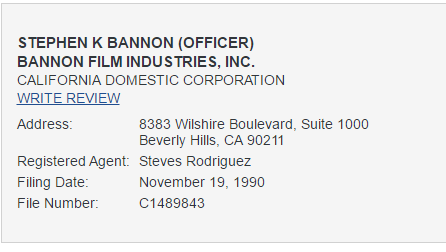 Rodriguez has been the registered agent for most of Bannon's businesses and he was the accountant for several of Bannon's movie productions. 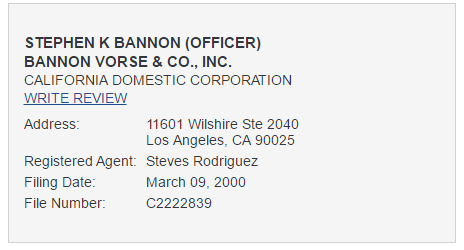 Currently Rodriguez is with the accounting firm, Freemark Financial, located at the now infamous address, 8383 Wilshire Boulevard, suite 1000, which is also the registered address for Breitbart News, Cambridge Analytica, and Glittering Steel Productions. Though he's in California, Mr Rodriguez was the tax preparer for Reclaim New York, a 501c3 charitable organization created by Stephen Bannon and Rebekah Mercer. 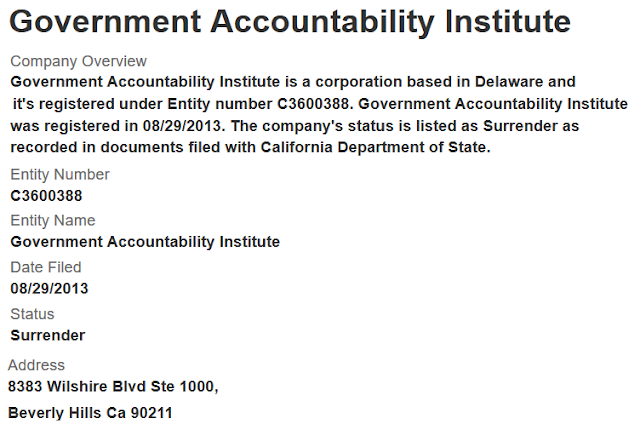 The Government Accountability Institute was founded by Stephen Bannon and Peter Schweizer in Florida, but for a short time it was also registered in California. GAI and Schweizer were responsible for the book, Clinton Cash. 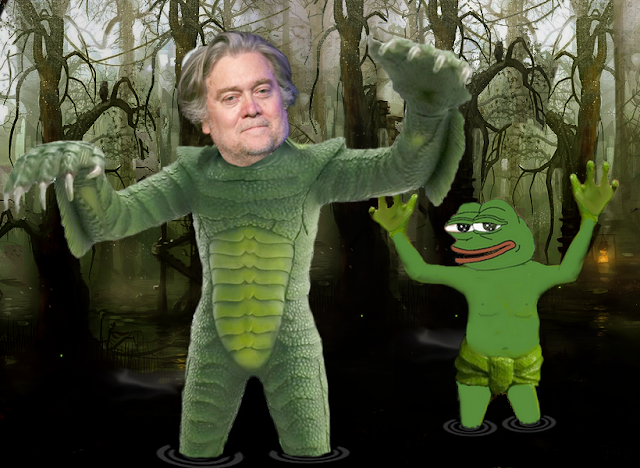 Bannon directed the movie. 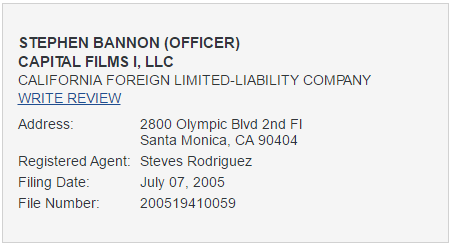 Bannon has had more businesses than the ones listed below, but the ones below are those with Rodriguez as registered agent. Bannon and Rodriguez have also shared office space and acted as power of attorney for each other. Though he ended up as Trump's Chief Strategist and Senior Counsel, he didn't get on board the Trump Train right away. Bannon started out working with Rebekah Mercer to get Ted Cruz elected and to accomplish this he created his own propaganda machine united by Steves Rodriguez as the accountant and/or registered agent. 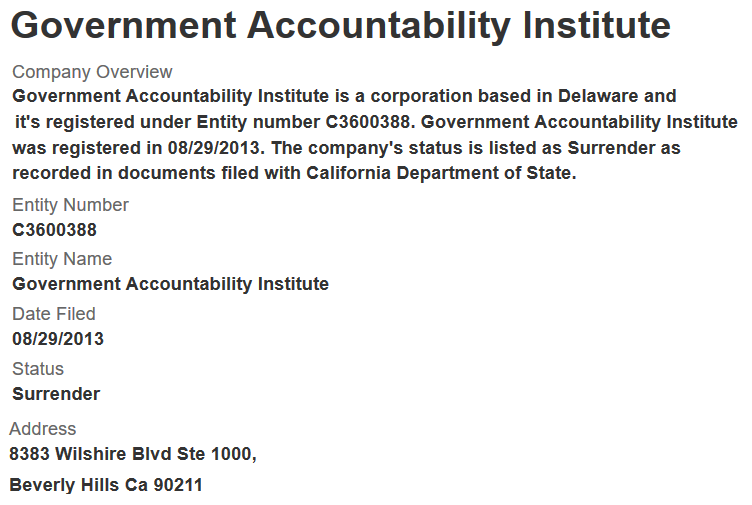 The non profit organization, Government Accountability Institute, was created and used (illegally) for opposition research looking for anything that could be manufactured into ammunition against Cruz' campaign competition. Tax free at tax payer's expense. Also in the loop was the Data Mining business, Cambridge Analytica. They collected 5,000 data points on 220 million Americans-the majority of adults-and used the information to find buttons they could push to alter public opinion. Cambridge Analytica also claims after changing opinions they can motivate people into action. Knowing what buttons to push among American citizens, Bannon's team used this information to shape the opposition research from GAI to disseminate via Breitbart News and other conservative blogs.